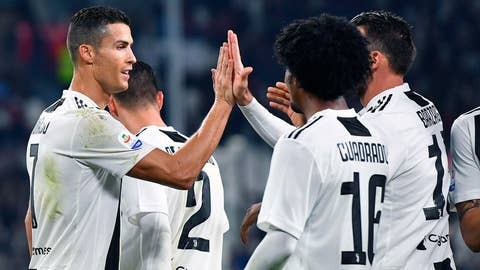 Cristiano Ronaldo may not have found the net for Juventus in Saturday’s 3-1 win over Cagliari, but the Portugal international has helped his new club win 10 of its opening 11 league games. The Bianconeri have 31 points from a possible 33, surpassing their previous record of 30 points from the first 11 games in the 2005-06 season. Juventus equaled the record set by Roma in the 2013-14 season and Napoli in 2017-18, and it has only dropped points in a 1-1 draw at home to Genoa. “The teams behind us — Napoli, Inter and AC Milan — aren’t slowing down at all so we can’t afford to let up ourselves,” defender Medhi Benatia said Saturday. Coach Massimiliano Allegri wasn’t entirely satisfied afterward, accusing his players of mentally drifting out of the game at times. Indeed, the team almost conceded a late equalizer before Ronaldo set up Juan Cuadrado for Juventus’ third goal. And Pjanic has issued a warning to United. “It will be an important evening, from which we can qualify for the next round,” he said. “In Manchester, we played a great game (winning 1-0) but once again we didn’t close it out how we should have. Napoli put five goals past Empoli on Friday but coach Carlo Ancelotti said the losing team played the better football — and the statistics back him up. Empoli had the majority of possession and also completed more passes than Napoli but lost 5-1. Napoli hosts Ancelotti’s former club, Paris Saint-Germain, in the Champions League on Tuesday. Inter Milan goalkeeper Samir Handanovic will face a much tougher test on Tuesday against Barcelona than he did at the weekend. Handanovic was mainly a spectator as Inter crushed Genoa 5-0 on Saturday. Genoa had just two shots on target and the only time Inter looked like conceding was when Handanovic almost scored a bizarre own-goal, shortly after the Nerazzurri’s opener. Handanovic miskicked Stefan de Vrij’s back pass and the ball rolled agonizingly across the face of goal before the Slovenian goalkeeper reacted and raced after it. Virtus Entella finally played its second match of the season in the third division on Sunday. Dany Mota scored three minutes in for Entella and Davide Diaw doubled its tally in the 73rd for a 2-0 win over Pisa. Entella had been sitting idle for 47 days in protest. The Ligurian club is one of six squads that still believes it deserves a spot in Serie B, which was reduced from 22 to 19 clubs this season following the bankruptcies of Avellino, Bari and Cesena. Entella, Novara, Pro Vercelli and Ternana — the four clubs relegated at the end of last season — plus Catania and Siena, which lost in the Serie C playoffs, are all still arguing for a place in the second division.